Ranking co-occurrences in the scientific literature using the Log of the Product of Frequency (LPF). The LPF is not sensitive to literature volume. Use of the LPF for ranking co-occurrences helps investigators explore pathway, disease, and intervention concurrence with greater efficiency and accuracy. By using the LPF, Literature Lab™ avoids lenses associated with terms or genes that have a great deal of publication volume, bringing to light important associations that are masked by reporting that emphasizes "greatest hits" genes and terms. The LPF is used on all co-occurrence presentations on genes and biological and biochemical concepts in the Literature Lab™ database. The logarithm of P is computed to reverse the attenuation bias from multiplying two fractions. Co-occurrences are evaluated in Literature Lab™ PLUS using the same technique. The LPFs are computed for each gene in a gene set and the 78,000 terms, providing an analysis of relative intensity of associations in the literature for the set. When multiple genes are mentioned with a term the LPFs are added, resulting in an LPF for the gene set with the term. The Literature Lab™ PLUS analysis thus is an analysis on the gene set as a set. The LPFs of the submitted gene set are compared to the same computations applied to 1,000 random gene sets to determine significance. P-values are presented, with significant associations highlighted. The literature Lab PLUS gene list analyzer wraps up the analysis by computing a clustering analysis on the significantly associated functions with the genes. 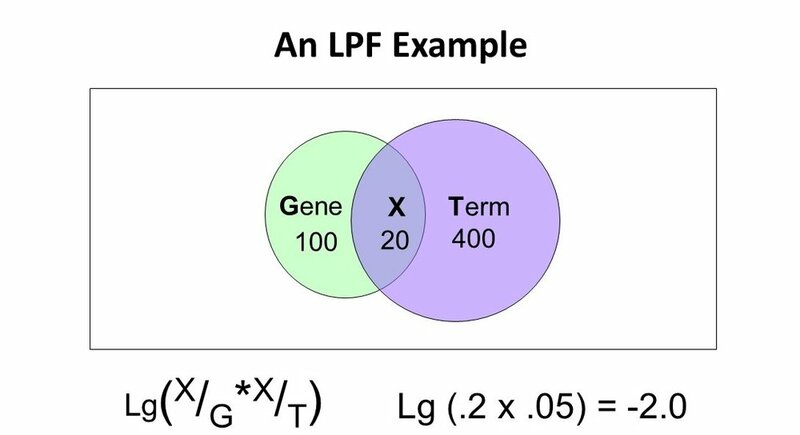 The LPF is always a negative number (except when the circles in the Venn diagram are congruent) and the larger the absolute magnitude of the LPF, the weaker the association relative to other gene/term or term/term co-occurrences in a dimension, e.g. : pathways or diseases, as shown in the examples on the Literature Lab™ page.